The number of teenagers who own mobile devices is increasing and while this enables them to stay in touch with friends and family, it also brings some concerns for parents. With applications like FamilyWhere, parents can use technology on their favor and keep an eye on the way their kids use their mobile devices. With this family locator by T-Mobile, parents can make sure that their kids remain safe and prevent them from going to areas that could be dangerous for them. FamilyWhere also lets you establish location limits and keep track of your child’s whereabouts to make sure that they stay within the boundaries you have set. This application is designed to give parents greater control and peace of mind when it comes to the safety of their children. What is T-Mobile FamilyWhere Locator? This software by T-Mobile allows you to locate phones on your account and see where family members currently are. You will see their location on a map in real-time and they can also keep you updated via text message. It is possible to track any phone on the T-Mobile 4G/LTE network and when the users you are following visit a new place, you will receive text notifications. FamilyWhere also lets you schedule automatic location checks and you can use your phone, tablet or computer to keep track of your loved ones. This application is a convenient option to make sure that everyone on your family is safe, specially children. FamilyWhere can be tested for free for 30 days and after that, you can continue the subscription for $9.99 per month, which is added to your T-Mobile bill. FamilyWhere lets you track your family members using your smartphone, tablet or your computer so you can keep an eye on them at any time. GPS has to be enabled to track tablets but it is not required if you are tracking a smartphone. However, it could have an impact on the accuracy so it is advisable to encourage everyone in your family to keep GPS enabled on their devices. In order to start using FamilyWhere, T-Mobile subscribers will need to create an account after downloading the app from the App Store or Google Play. After the installation, you will be able to start using the app and will discover the colorful interface that offers a good variety of settings. The app is lightweight and easy to use and as soon as you open it, you will be able to select between the free check-in option or the free family locator program. Although downloading the app is not required for Android, it is recommended since it will offer a more efficient experience. It is also possible to monitor the location of the devices in your FamilyWhere account using your web browser. T-Mobile also offers technical support to help you with any issues you may come across or any queries you have. With this family locator, you will be able to find the location of different devices associated to your account. The app provides fast and highly accurate results. Everyone in your family can check-in with others in real-time via text messages. You will also be able to see their location on a map, all from within the app. Parents will be able to use the phone locator app to get notifications when their children or someone who is connected to the FamilyWhere account, goes to different locations. T-Mobile FamilyWhere allows families to stay connected and to ensure that everyone is safe. Thanks to the 30-day free trial, you can check the service to confirm if it is right for you and your family, before paying any fees. The app is particularly helpful for parents who want to ensure that their kids are where they are meant to be and to be notified of any unusual movements. This gives parents more control and helps them to take quick action if their kids are in possible danger. Even if you don’t have your phone with you, you can use a computer to log in to your FamilyWhere account. The app is easy to set up and to use and it keeps detailed information about the location of the devices connected to the account. The application can be accessed from any device. You also have flexibility to set specific times for check-ins and the information is protected with a high level of privacy and security. With the help of T-Mobile FamilyWhere phone locator, you can stay connected with your family members no matter where they are. It is a good way to ensure that they are safe and to be ready to offer assistance whenever is needed. In order to be able to track a device, it must be turned on. That means that if the battery dies or the devices is powered off, it won’t be possible to find out its location. FamilyWhere only allows you to track devices connected to a T-Mobile 4G network and a data plan is required. While the results are generally very accurate, FamilyWhere doesn’t offer complete accuracy due to environmental aspects that can have an impact on GPS detection. In some cases, the GPS displays results in a wide range, which makes precise location difficult. In addition, the location results tend to be more accurate on Android than on iOS, in fact T-Mobile doesn’t guarantee the accuracy of the information provided by its phone locator. The free trial gives you the possibility of using the program for up to 30 days to find all the features that it offers and decide if it is works well for you. If you want to continue using FamilyWhere, after the 30 days the cost is $9.99 per month and you will be able to monitor up to 10 phone numbers on one account. If you don’t want to continue using the service after the initial 30 days, make sure that you cancel before the trial expires. 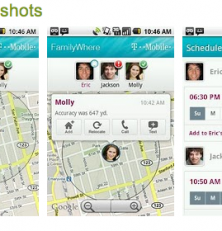 If you and your family are a T-Mobile users, FamilyWhere is worth considering since it offers a way to keep track of your children’s whereabouts. It can help you to ensure that they are safe and will also come handy when someone needs help or needs to locate a family member quickly. Although it is not a perfect solution and there are some accuracy issues occasionally, overall FamilyWhere is a good option and thanks to the free trial, you can check it out to decide for yourself if it is the solution that you need. This was very helpful, thanks so much. Does it send them a notification every time you check? ATT’s FamilyMap sends a notification once a year or so.